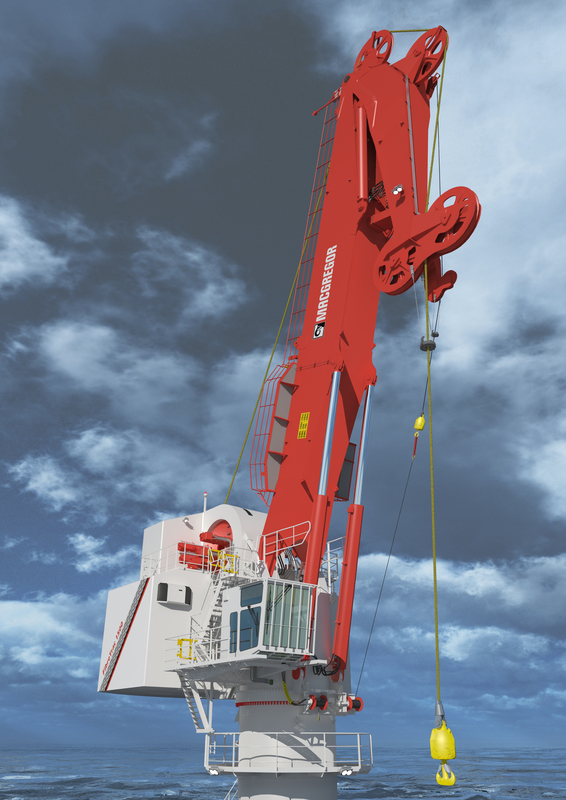 "MacGregor launched its fibre-rope crane range in 2016 and as part of demonstrating its capabilities to the market, we have entered into a programme to build, certify and validate the world's most advanced fibre-rope knuckle-boom crane that the market has yet seen," says Høye Høyesen, Vice President, Advanced Offshore Solutions at MacGregor. "The greatest advantage of fibre rope when handling loads in ultra-deepwater is that it weighs virtually nothing in water," continues Mr Høyesen. "This neutral buoyancy means that, regardless of the length of rope paid out, the fibre rope does not add anything to the load experienced by the crane. Cranes can therefore retain their full payload lifting capacity all the way down to maximum depth. This is in complete contrast to using wire rope, where the ever increasing weight of wire paid out limits the load permissible in relation to depth. "We strongly believe in the advantages that this technology will deliver to our customers. This is not just limited to payload, but also includes significant weight savings, rope lifespan and ease of maintenance, handling and logistics." The crane has been designed and will be built to comply with the latest DNV GL lifting appliance, fibre and rope manufacturing rules. MacGregor intends to provide the first system fully certified in compliance with DNVGL-ST-E407 (deployment and recovery system). "Compliance with DNV GL's strict regulations should provide end users with even greater confidence in the long-term use of this technology for this purpose," he adds. "DNV GL is excited to have been chosen for the technology assurance and certification of this project," says Arnstein Eknes, Director for Special Ships at DNV GL. "Compliance with DNVGL-ST-E407 enables the long-term outcome of this technology to be certified, by moving towards focus on the 'lifetime management' of key elements within the system. Owners and operators can document towards their customers the fitness for purpose over the entire lifespan, managed with basis in the certificate of designated service." The crane will incorporate many unique technologies including the Parkburn Deep Water Capstan with storage winch capable of accommodating 4,000m of 88mm rope. It will use Lankhorst's Lankodeep fibre rope made from DSM Dyneema's DM20 XBO fibre with DNV 303 certification. The rope will be connected directly to the crane hook using a socketed termination from Applied Fiber. The crane will also feature an advanced rope monitoring and management system that maximises rope lifespan and provides clear lift line status information for the operator at all times. It will be controlled using MacGregor's latest control system with the added advantage of providing real-time data feedback to onshore locations using the MacGregor 'OnWatch' feature. "The entire system has been designed and optimised to enhance user performance and ease of maintenance," concludes Mr Høyesen. "MacGregor is excited to demonstrate the crane's market potential and we will work closely with key customers during this time."